Knotty Tree Service is staffed with Certified Arborists, specializing in tree removal, pruning, and hazard tree evaluations. We have been providing safe tree care services for homes, office complexes, local businesses, cities and apartment complexes since 2000. 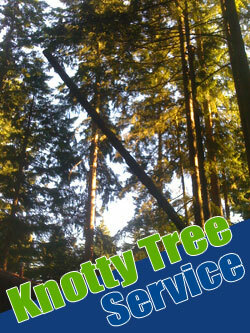 Contact Knotty Tree Service for your tree care needs. Knotty Tree Service is owner-operated, licensed, bonded and insured for your protection and extensively trained to meet any of your tree care needs. We are happy to provide hazard evaluations, reports, consultations, as well as pruning, removals, and stump grinding. We are extremely knowledgeable in all aspects of tree care. Stump grinding, tree stumps of any size. Pruning to remove tangled branches while maintaining the integrity of the tree. Tree climbing to lower and remove heavy wood. Hazard tree evaluations documenting possible dangers or issues to help protect you from potential legal struggles with neighbors. Protect your home or business from potential hazardous tree damage. 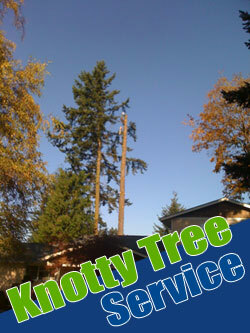 Contact Knotty Tree Service today. Certified Arborists will evaluate and correct your tree hazard problems. Our tree climbers are fully trained in the ANSI standards of pruning and removal of trees. At Knotty Tree Service we’ll take care of any trees that are dying and diseased, damaged from wind storms or accidents, likely to fall on your property, or simply outgrowing their space. You’ll save time, money, and hassle. We look forward to serving you! Climbing and working in trees demands specialized equipment and skills. At Knotty Tree Service, we are professionally trained tree climbers. Our tree climbing methods aim to be minimally invasive and prevent unnecessary damage to the tree. We use the best equipment to conduct our work safely. As tree climbers and arborists, we have one of the most dangerous jobs in the world, sometimes performing difficult maneuvers over 100 feet in the air. Before climbing any tree, we thoroughly inspect it and make sure it is safe. Please contact us at Knotty Tree Service if you have a project that requires tree climbing, tree cutting or tree removal.